Russian gold miner Highland Gold said Friday it is on track to meet its full-year output target of 200,000-215,000 troy ounces of gold and gold equivalents. The company, which also published its results for January-June, said its gold equivalent production – a measure of gold and other metals expressed in units of gold – rose 9.5%, year-on-year, to 101,900 ounces. The group, which is part owned by billionaire Chelsea soccer team owner Roman Abramovich, said total production from its Mnogovershinnoye, Novoshirokinskoye and Belaya Gora mines reached 101,900 ounces in the first half. A fully unhedged average gold sale price of $1,641/oz represented a 13% increase compared with the corresponding period last year. And there was a 16% increase in total JORC compliant resources to 12.9 million oz, through exploration and acquisition, compared with stated figures of 31 December 2011. 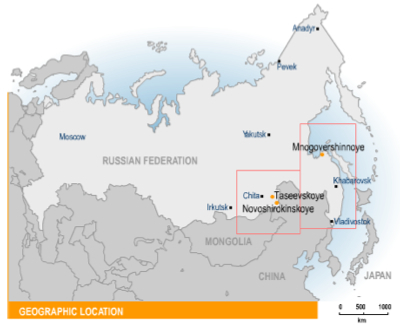 Highland Gold’s major activities are located within the Khabarovsk and Zabaikalsky regions of Russia as well as Kyrgyzstan in Central Asia. As of 2012 the Company had 3 operating mines, 3 development project and 5 exploration properties.